Nathan Grant is nine years old, his sister, Chloe, is six. They live in a large house in the English Midlands with their parents, Ian and Louise. Their father’s job as a successful lawyer provides an affluent lifestyle and all their emotional needs are met by devoted parents and the extended family. The two children are academically bright and popular at school with both teachers and other pupils and life couldn’t be better. But all that changes on one terrible night, when Ian and Louise Grant go out to dinner and are killed in a car crash. Nathan and Chloe go to live with their mother’s twin sister, a loving and caring woman who is determined to give the children the best life possible. Her husband, however, is a social misfit of a man who was raised single-handedly by a religiously-obsessed mother. To please her, he has had to marry a woman, despite being more attracted to men and, tragically for Nathan, young boys. Paul J Turner was born in 1964 in Wombourne, Central England. After underachieving at school, something he apportions to 'messing around', he finally pulled his socks up and started training to be a psychiatric nurse at age 19. During almost 20 years working in the UK's National Health Service, he worked with people suffering from various disorders including the perpetrators and victims of sexual abuse and people with alcohol problems. He has had a long-term ambition to write a novel and decided to draw upon his professional experience for his first book. He now lives in Atherstone in Warwickshire, is married for the second time and has two grown-up children from his previous marriage. It can also be purchased from the iBooks Store directly from iPhone, iPod Touch and iPad. It will soon be available via other retailers. See E-book Reader Matrix if you are not sure which format you need for your device. An impressive debut novel! 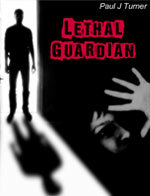 Lethal Guardian was very easy to read; the plot is engaging and moves at a fast pace. Although I found parts of the book slightly uncomfortable to read, touching upon some very heartfelt issues, I could not put it down!! The book takes you on a roller coaster of emotions, that lead to a satisfying conclusion. I highly recommend it. Would definitely read another book by this author. What a fantastic book!!!! I have read many books similar to this and it is most definitely up there with the best. I strongly recommend this book to everyone and hope the author writes more books as good as this one!!! Wow what a brilliant first novel. A friend recommended this to me and, after reading the blurb, I gave it a go and couldn't put it down. I read it in one afternoon. The first chapter leaves you wanting to know what's going to happen next which carries on throughout the story. The subject matter can be uncomfortable in some parts but this is needed with the subject of child abuse, bearing in mind this is fiction not a NON fiction novel like other novels about child abuse. I feel the author has described scenes really well. I gave this novel 5 stars. If you're looking for a gripping fast-paced, well written story, this is well worth a read. I am looking forward to reading more stories by this author. A book I couldn't put down. Very well written and I have recommended it to friends and relatives. There are some difficult issues but they are handled in a thought provoking way. I would definitely read another book by this author.